One of the first i-TTL flashes to boast a built-in radio receiver with "W-CLS", is the Shanny SN910EX-RF any good? 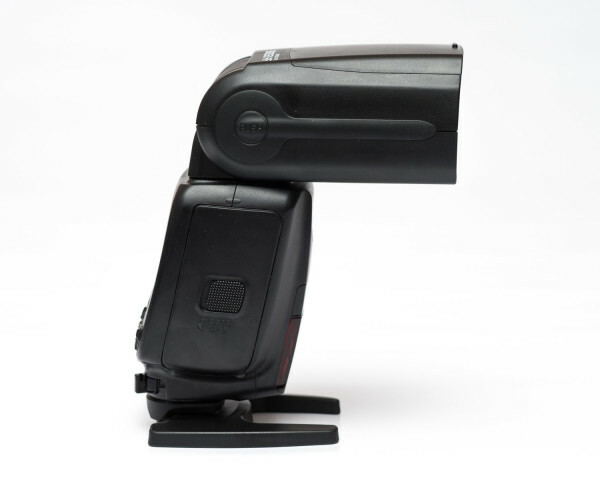 In recent years we have seen an evolution of the triggers we use for flashes. They changed from dumb manual triggers to smart triggers that were HSS and TTL capable. The latest step in this process is the integration of the triggers inside the speedlites. I have had the feeling that Nikon users were being left out of the latest innovation for speedlites when compared to Canon. 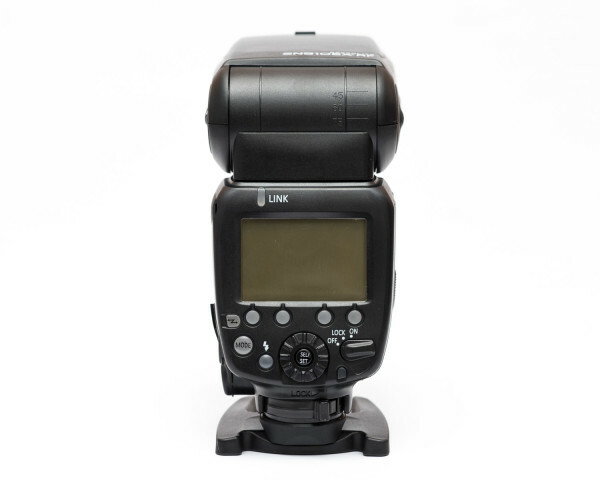 Canon users are given a high number of choices of speedlites in which the TTL trigger is integrated. Initially Canon itself released a system that was capable of doing so and not much long several other manufacturers followed suit. Unfortunately for Nikon there is not so much choice, but Chinese flash manufacturer Shanny is about to change that. Shanny has created the the SN910EX-RF, which they claim as first in the world. Although this is not completely true — as there are others — but without a doubt they are one of the few that offers this type of flash. What is special about this flash is that it features a built-in 2.4 GHz TTL transceiver, which can function both as a master and a slave to other SN910EX-RF flashes. 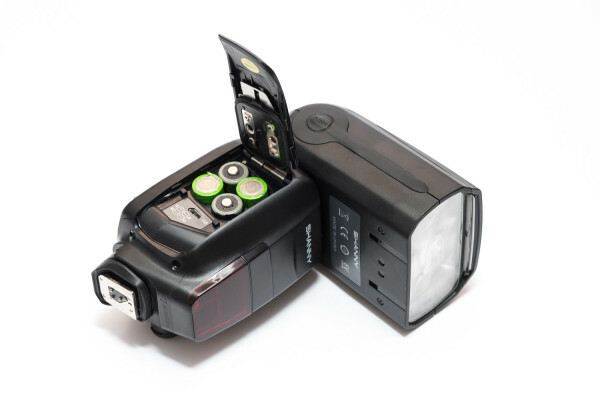 Shanny’s so-called W-CLS, or Wireless Creative Lighting System is an aftermarket radio protocol for Nikon-compatible flashes and works only with other SN910EX-RF flashes at the time of writing. The announcement of the wireless-enabled speedlite for Nikon was something that I have been waiting for for quite a while. The two other speedlites which are currently on the market which have integrated TTL transceivers are more expensive than the one from Shanny, so the introduction of the SN910EX-RF was a welcome addition. Personally I was eager to test it and fortunately for me Shanny was willing to send me two flashes so I could test the wireless functionality. Christina from Shanny also mentioned that she is available for any questions that readers of LightingRumours would have. She can be reached using this email address: [email protected]. My first impressions of the flash were surprisingly good; it feels and looks solid. The way how the plastic parts fit together and feel gives me the idea that this is a premium product. For instance, the battery door is solid (metal hinged) and rotating the flash head requires a good amount of force, but not too much. However, to tilt the flash head you will need to hold a button in order to unlock it, otherwise it cannot be moved. While it gives a secure lock, it is not my preferred solution due to the extra time it takes. Inside the box we find the normal accessories that are included with most higher end speedlites, a protective bag and a flash stand. A Stofen-style diffuser is available separately, but was included in my kit. 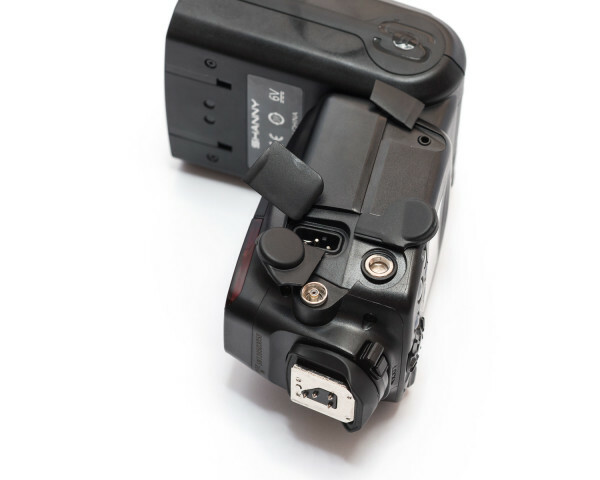 On the exterior a 1/4″ thread can be found, as well as a PC sync terminal and an socket to connect an external power source. It is also possible to update the firmware of the flash using a USB cable. Most of these features can be commonly found with other flashes as well, so nothing surprising here. The first thing I thought after unboxing the flashes was that they look identical to other flashes from Shanny. Without a doubt Shanny has used the same plastic shell for the SN910EX-RF as for their other flashes. From point of view of Shanny this is a smart decision, since it would have more expensive to create a different plastic shell for each of their different flashes, costs that would have increased the price of their flashes. After mounting the flash on top of my Nikon D800, I noticed that the locking mechanism of Shanny works rather well. There is little to no play between the camera and the flash, giving a very secure lock. With other third party flashes this is not always the case and I am happy that Shanny managed to give such a secure feeling. As I mentioned in the previous section the SN910EX-RF looks rather like other flashes from Shanny and therefore it shares the same interface, button layout and screen. This interface looks a lot like the Canon 600EX-RT interface and can be initially a bit confusing, but after you have used it a little bit you will realize that it is easy to use and intuitive. Unfortunately Shanny also has implemented a similar main control dial as can be found on the Canon 600EX-RT. Call me old-fashioned, but I prefer a D-pad over a dial since it gives me more control and feels more logical to me. I am not sure why all flash manufacturers are implementing dials on their flashes instead of D-pads, but I do not see it as an improvement. It is hard to get the haptic feedback of the wheel exactly right, because when it’s too stiff it is annoying to use, and too loose means you do not feel what you are doing. I am also always afraid that over time these dials will wear out and become too loose. If you are familiar with other Shanny flashes you will immediately recognize the dot matrix LCD screen. Its big, has good contrast and the backlight is great. Due to the slightly lower resolution characters can appear slightly pixelated, but they are still very easy to read. By pressing the mode button it is possible to switch between TTL, manual and stroboscopic mode, as would have been possible with the normal SN600SN without radio. But what is far more interesting is to activate the wireless mode. A dedicated button lets you cycle through master, slave or S1/S2 modes. Unfortunately Shanny did not include the Nikon’s optical CLS, which is available in the SN910EX model. Just above the LCD screen a LED can be found which indicates if a master speedlite has been linked with a slave speedlite. Even though the SN910EX-RF uses a dial for navigation I find it easy to navigate through the various menus. For instance, adjusting flash power can be done fairly easily, especially due to the large LCD screen it is easy to see what you are currently adjusting. The fact that Shanny already has some experience with this type of speedlites helps them a lot, but it should also be realized that the SN910EX-RF is for a large part a Nikon version of the Canon 600EX-RT. Size, button layout and menu structure is all very similar. During the last few weeks I have used the two Shanny flashes during a number of shoots and I have to say I am impressed. They work really well. The TTL exposure is accurate and also very consistent, irrespective of you are using it on or off camera. Stability of the 2.4 GHz wireless link is great; I have never had issues with the master and slave flash not being able to communicate or link. Initially it takes about two seconds before the link LED indicates that the flashes are communicating with each other, but once they are linked the connection is rock solid. My way of working with the flash is as follows: if my subject covers the most of the frame I simply let the off camera flash fire in TTL. If my subject covers only a small part of the frame then I first meter the flash on her with FV-lock and then continue to take photos. This way I managed to get accurate results with the TTL mode, even in HSS; see also the results I have obtained with the Shanny below. The quality of the AF assist beam is certainly worth mentioning. It is one of the better ones I have used from third party flash manufacturers. The one that Nikon implements in their flashes is still much better, but the one from Shanny is actually useable, unlike a lot of other third party flashes. It activates and deactivates at the right moment and it covers a good portion of the AF points, including the most important central point. The Shanny does not project small dots like other flashes, but big lines instead and therefore your AF points do not fall in between the dots. Even though the Shanny SN910EX-RF has transceivers built in, I know many of you would like to know how it works with TTL triggers. I have briefly tried both the YongNuo YN622-N and the Pixel King Pro. The YongNuo triggers work in TTL and Manual mode and give a accurate exposure, but have a significant delay between the pre-flash and the real flash. The delay is around 0.2 seconds and it seems like the red-eye preflash option is turned on. The Pixel triggers work much better, without any delay. However, the general impression that I got with the Pixel triggers is that they tend to overexpose in TTL mode and the TTL results are not always accurate. Although both triggers do work, they do not play nicely with the Shanny flash and I am not sure if I would recommend you to use it with these triggers. On a lot of websites the recycle time of the Shanny is stated as being around 2 seconds, but this is not completely true. Quick recycle is around 1.9 seconds and normal recycle around 2.6 seconds. Quick recycle means that it is possible to fire another flash, albeit with slightly lower power. Your photo will be underexposed. Normal recycle indicates that after 2.8 seconds the capacitor is again fully charged. Basically, the quick recycle is a gimmick, a number that is solely meant to impress people. The real recycle speed is 2.6 seconds, which is on par with higher end speedlites. The power of the Shanny is also very similar, if not identical to the higher end speedlites from Nikon, Canon and YongNuo. When mounted in a softbox I had trouble finding a significant difference between them (everything measured was under 1/3 of a stop). An internal fresnel inside the Shanny makes it possible to change the zoom from 20 to 200mm. The light distribution is not perfectly equal at the maximum zoom setting, but this is not the case when using a speedlite from Nikon or Canon either. For me there are two things essential when reviewing a flash, which are the performance and the way they are used. Often you see that the performance is great, but the device can be rather annoying to use and in the end you will prefer to use something else. I am happy to say that Shanny has managed to make a flash that not only performs well, but is also very user friendly. During my time with the units I really enjoyed using them since it is an such elegant solution for TTL triggering. In a way it is the Nikon version of the Canon 600EX-RT. Menu structure, design and button placement are all very similar. What currently is a big drawback of Shanny’s wireless system is the lack of a dedicated trigger and receiver. 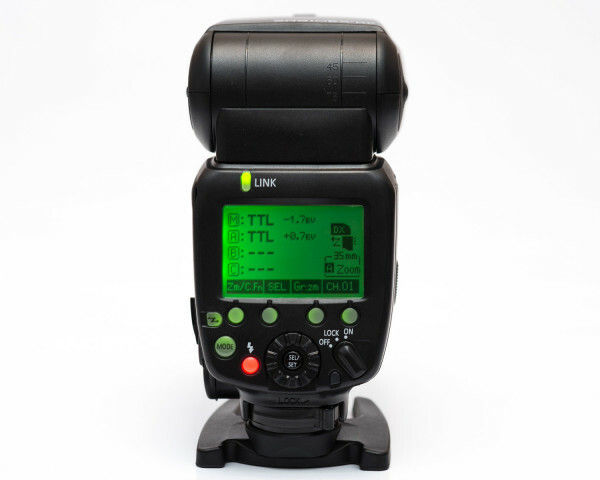 Using a speedlite as master is a bulky and expensive alternative to a dedicated transmitter. Shanny has announced that they will be releasing a dedicated transmitter soon, and knowing them, it is going to be very similar to the Canon version that they are currently already selling. 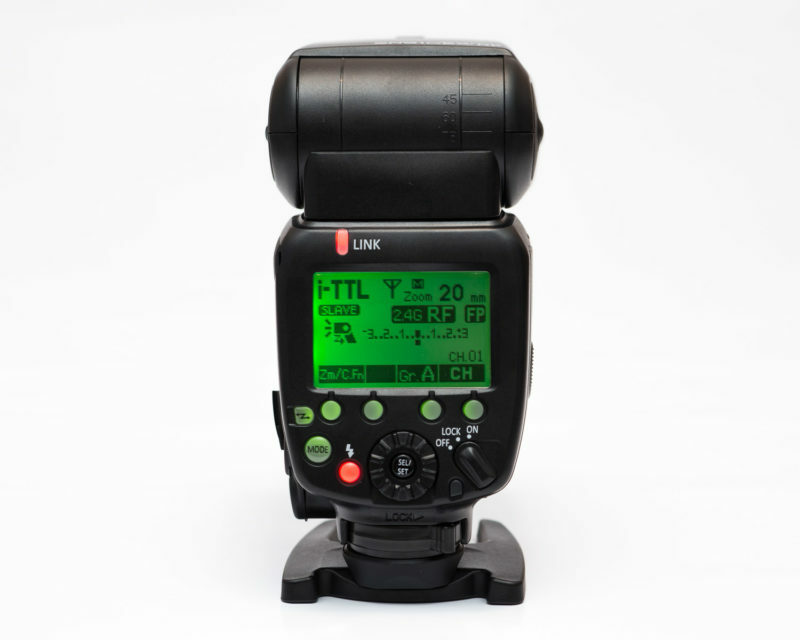 However, this still leaves you with the fact that you cannot mix your existing TTL speedlites with the Shanny system, meaning that you have to commit more and invest more. At the moment of writing this review the Shanny SN910EX-RF is being sold for $230. Even though it’s the cheapest speedlite currently on the market that has built in TTL triggers which work with Nikon cameras, I still find it a pretty substantial amount of money when compared to other speedlites. The non wireless Nikon flash from Shanny (the SN600SN) is priced at $120, meaning that indirectly you are paying roughly $100 for the wireless transceiver. When you consider the price of the Canon version of this flash, which is $150, you really wonder why the Nikon version is priced at a premium. 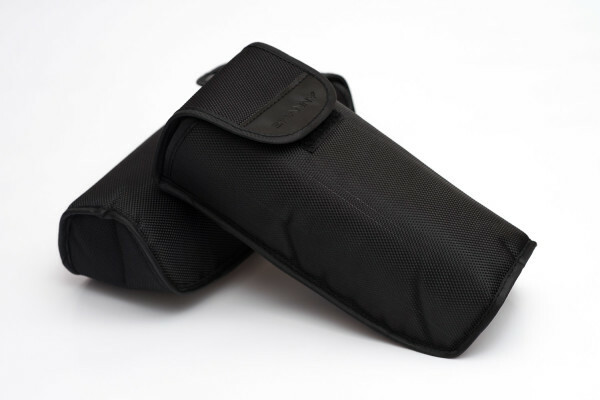 There is no doubt about it that the Shanny SN910EX-RF is a great flash. The 2.4 GHz is amazing since it is very reliable and gives very accurate results. It is really well built and it is loaded with features. The addition of built-in transceivers was something that Nikon users have been waiting for and I think Shanny made the first step of making this mainstream, as is already the case for Canon users. It is unfortunate that a dedicated transmitter hasn’t been released yet, but it will come soon. Personally I would consider the price as a bigger issue, since they are not very cheap. 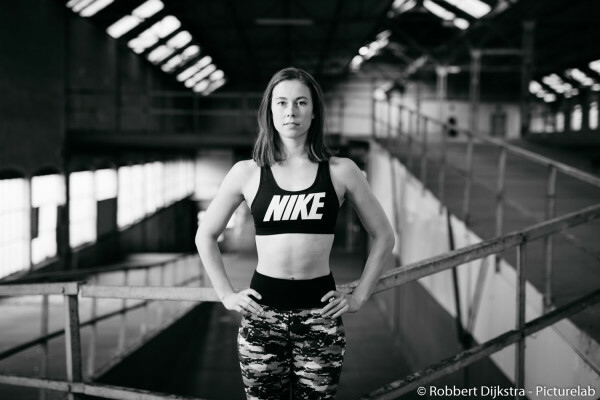 If you want to buy multiple flashes so you can use the wireless functionality it will be quite a substantial investment. 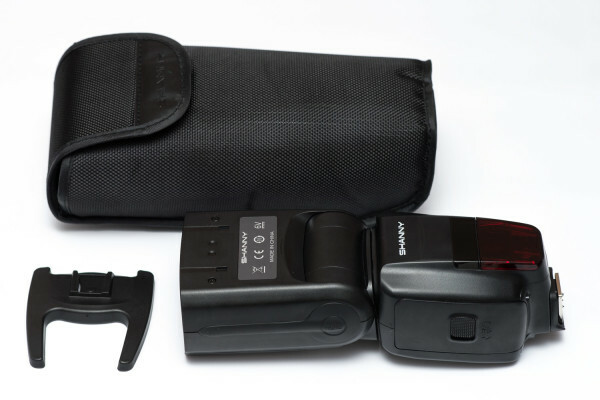 For photographers on a budget it might be better to opt for a different flash and an external receiver, but if your budget allows you to invest a little bit more in speedlites, the Shanny is an excellent option to consider. Personally, I would consider them as one of the better, if not the best, speedlites for Nikon currently on the market. The Shanny SN910EX-RF is available through Shanny’s Aliexpress store for 230 dollar, or at Shanny’s Alibaba store for distributors.